Today was our last day in Yellowstone. 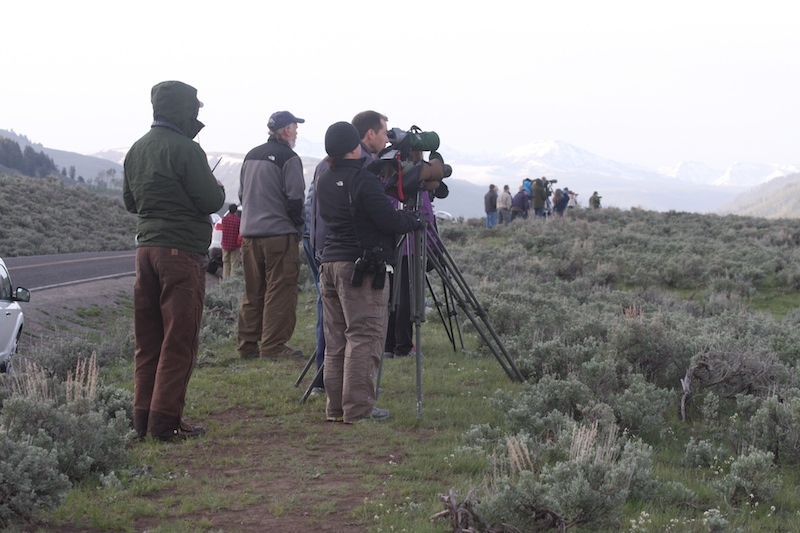 We woke up at 4am in the hopes to spot some wolves. From what we read, it was unlikely because there are so few wolves in the park, only about 80-90. 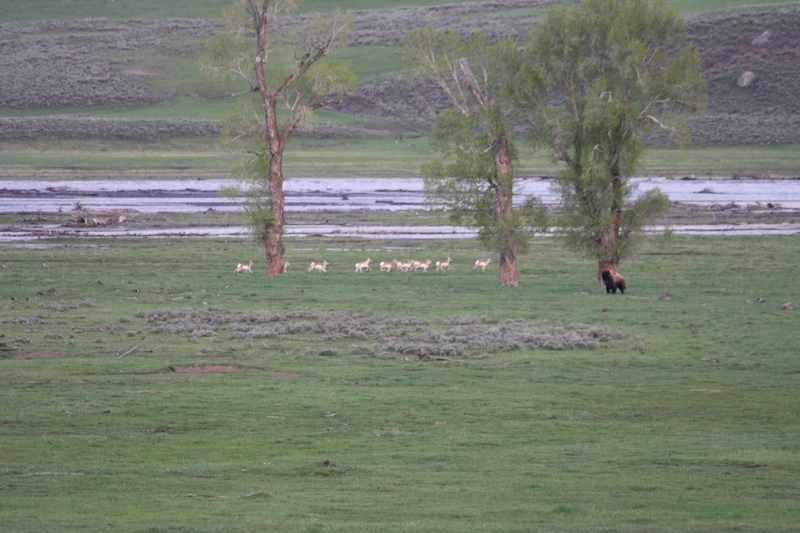 But Jimmy learned that the Lamar Valley would be the likeliest place to spot them. They're usually out in the early morning sunrise and at dusk. So we headed out before sunrise, not really expecting to see any but hoping for the best. But the Lamar Valley is teaming with other wildlife, so even if we didn't see any, it would be a beautiful sight regardless. When we got to the valley, we had no idea where to stop. Jimmy said to find a group of people with scopes and binoculars and we'd stop near them. So when we saw this big group of people that looked like they knew what they were doing, we pulled the car over. Turned out they were part of the Yellowstone wolf project that oversees the restoration of wolves in the park. But Jimmy and I were too shy to actually ask for specific information, but we happened to be standing next to them so we did a bit of eavesdropping. Early on, we heard about a bear, but nothing about wolves. And we didn't see the bear, either. 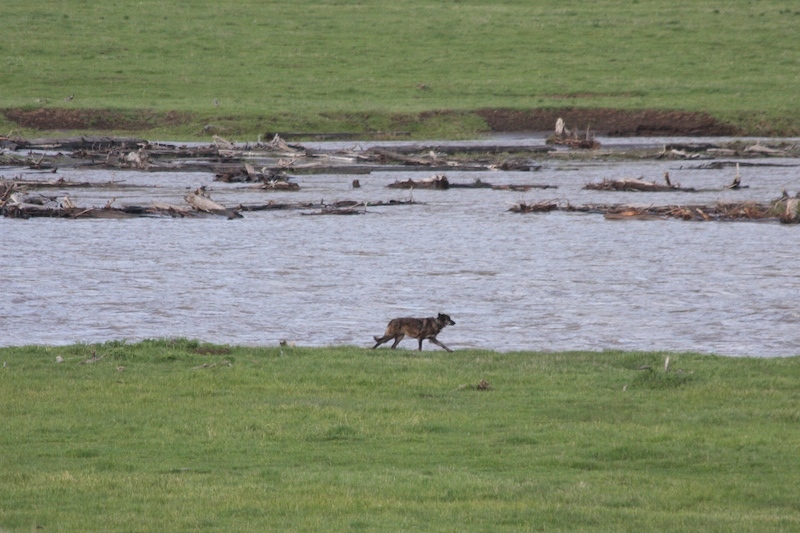 But within 5 minutes, Jimmy saw this one lone wolf on the far side of the lamar River! It was at least 1/2 a mile from us, but we were already super excited to see it! She was beautiful! Then about 5 minutes later we saw another wolf walking the opposite direction on our side of the river. We watched him till he crossed the river, then we lost sight of him. But most of the people were looking in the opposite direction that we were. So Jimmy started scanning the area that their scopes were all pointed and noticed a bunch of crows hovering around a big mound of something. Then he spotted the 2 wolves nearby. 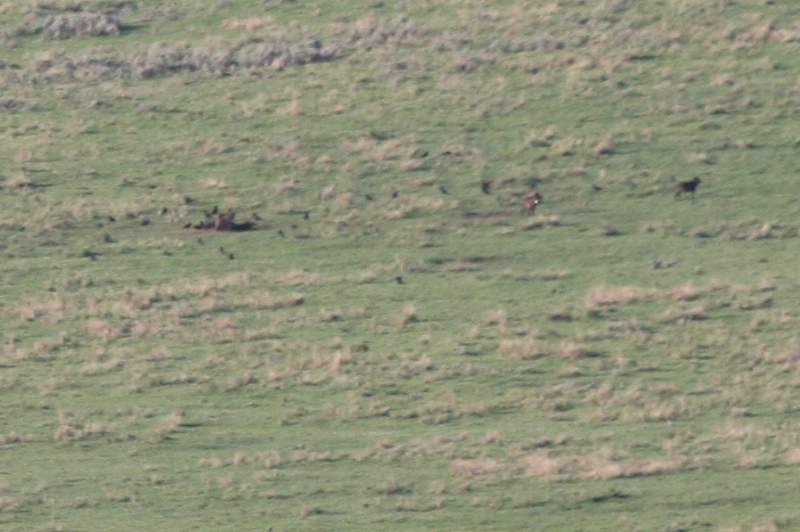 You can see the crows and the mound of something on the left, and the 2 wolves on the right. They are at least a mile away from where we were standing. We were so excited to see them together! It really is unlikely to see them at all since their population is so small. We knew that there must be a carcass where that mound was because of the crows. And when Jimmy looked through his binoculars, he could see glints of red. Then we noticed that the 'mound' moved, so it was another animal, we assumed another wolf. The 'mound' stood up and we realized it was a grizzly bear! 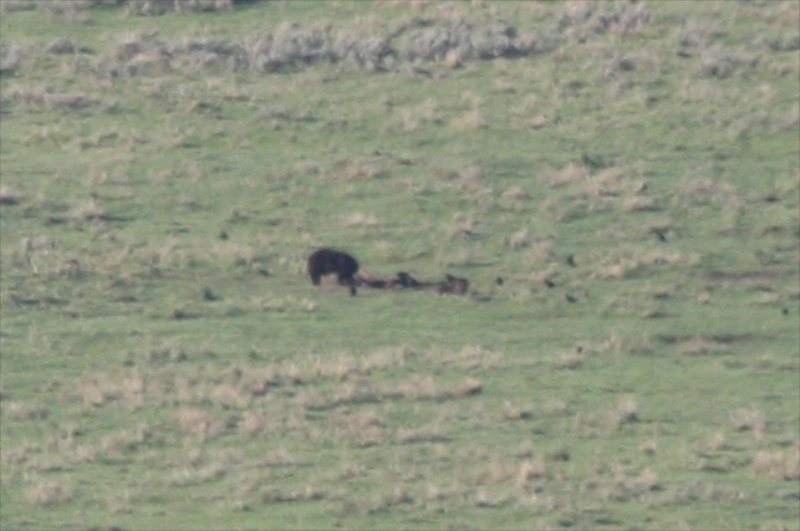 The wolves hovered for a while around the bear and carcass, but didn't seem to chase off the bear or visa versa. They stayed in the perimeter. 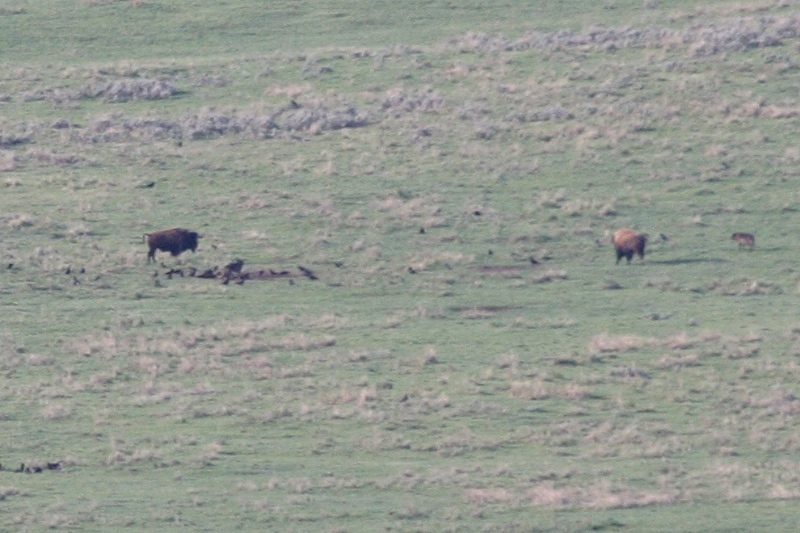 But then some bison came in towards the trio. The bear left right way, didn't want to mess with the buffalo. We assumed because he had already had his fill. But with the bear gone, the wolves quickly went in for their meal. The bison tried to threaten them, but the wolves stood their ground. You can see the bear leaving at the top of the photo. 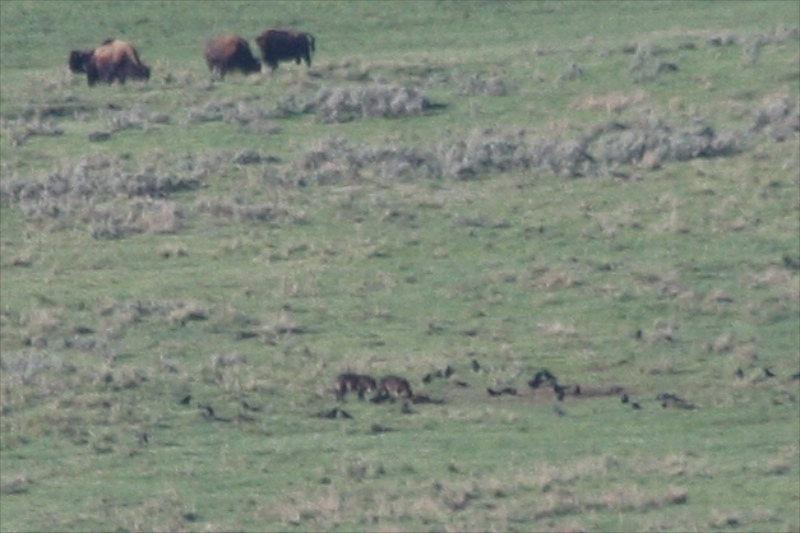 One of the bison would chase one of the wolves. 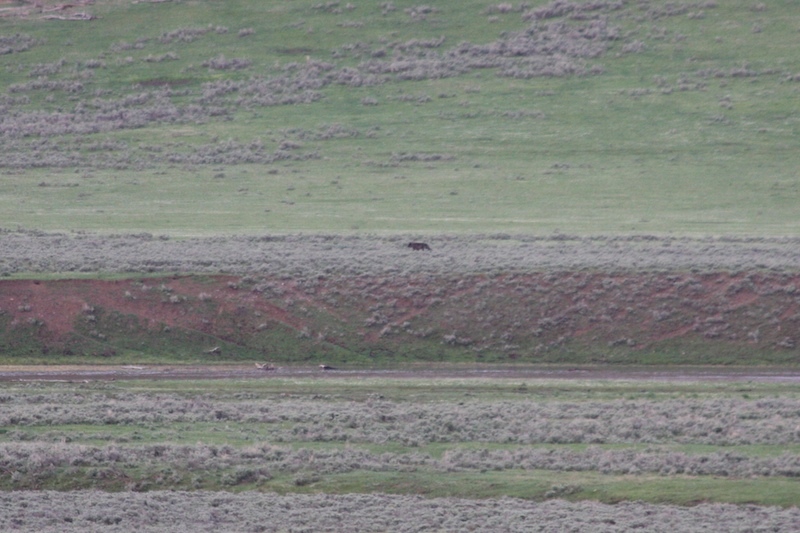 But the other bison didn't chase the other one away, just stood guard. They tag teamed each wolf, but while one wolf was being chased, the other one ate. This lasted for a while, but the buffalo gave up and the wolves were left to feed till they were full. We stayed and watched for over 2 hours. We don't know what the carcass was. 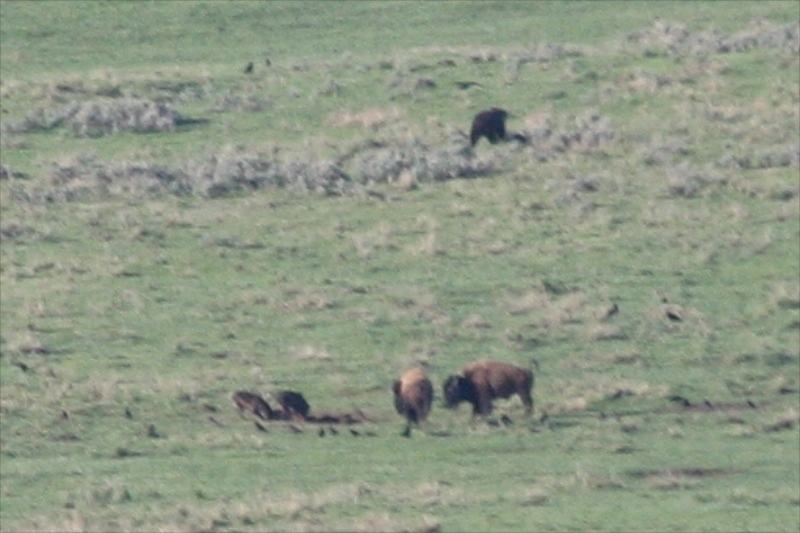 I'm completely guessing, assuming it was a buffalo because of how aggressive the bison were with the wolves. But that is a total assumption. One of the guys on the wolf project talked to a group of teenagers about how they track them so we walked over to them and listened in. The 2 wolves we saw were male and female from a pack of about 7 or 9 wolves. They have collars that help locate where the wolves are. Their territory is about 30 miles. We saw a few more things that morning and afternoon before leaving the park. But we sure were glad that we woke up early, despite how tired we were the rest of the day. It was a great way to end our Yellowstone adventures. All of my photos are pretty blurry. They were really far away and I had my camera on full 300mm zoom. Jimmy saw them with his binoculars that makes things about twice as zoomed in as my lens does, and once he spotted her, I pointed my camera in that same area and just hope for a good shot because I really couldn't see anything besides a black dot through my viewfinder. Oh boy, would have loved to see that! 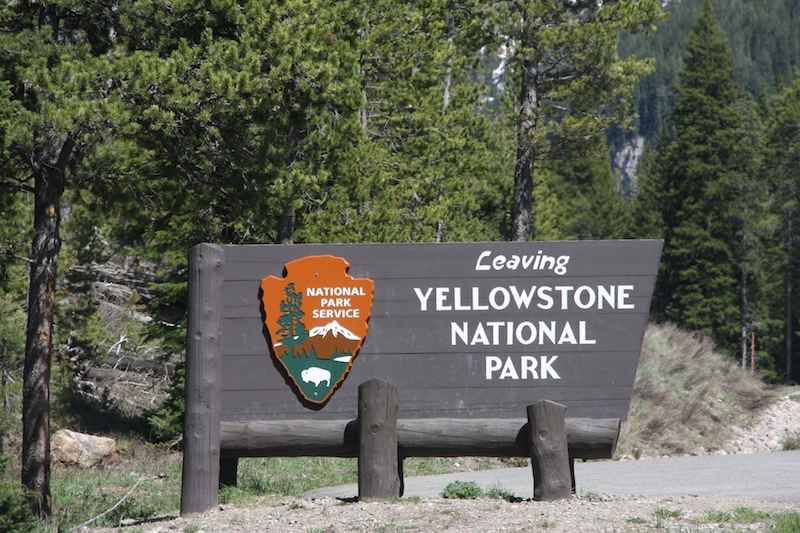 Maybe one day I'll get to Yellowstone. But I won't have to go all that way to see wolves.... we have them here in Ontario. When I lived in the country a bit further north, we could hear them howling at night. A scary sound, makes me feel a bit shivery! Awesome!!!! Thanks for sharing and the pics were great! !